It’s funny how some things come about. For example this recipe stemmed from a conversation I had with some of our neighbors. We got on the topic of food, as we pretty much always do, and we started talking about soup, as it is nearing soup season here in Wisconsin. I brought up the idea of Italian wedding soup, as obviously I was craving it, and later that day I was in the kitchen making it. I wanted a bit of a simple soup, but one that was hearty and that could be eaten over the course of a few days. This was exactly the soup that was not only comforting, but one that was really easy to make. If you have never had Italian wedding soup, it is essentially a soup made with meatballs, and some sort of greens. In my case, I used a variety of greens as I wanted something healthy to balance out the marriage of the meatballs. If it is any indication, my wife fell in love with this soup and said it was the best she’s had, as she has tried a variety from other restaurants in town. Start by adding your ground chuck to a mixing bowl. Toss in the egg, parmesan cheese, salt, pepper, parsley, and egg. Mix with your hands incorporate all of the ingredients. Form into golf ball sized meatballs. Next, heat a large skillet on medium-high heat. Take the meatballs, and sear on all sides, cooking until medium. Remove the meatballs, once cooked, and place them onto a paper towel lined plate. To a soup pot, add the canola oil and let it come to temperature. Toss in the onions, carrots, celery, broccoli and brussel sprout leaves (if you are using) and garlic. Cook until the onion begins to soften, then add in the stock, garbanzo beans, endive, and the meatballs. Cook this until the stock begins to boil, then reduce the heat and cook for about 20 minutes or so. When you are ready to serve, ladle the greens, stock, and meatballs into your soup bowl. Garnish with more parmesan cheese, and dig in. I don’t know what is best about this soup besides everything. 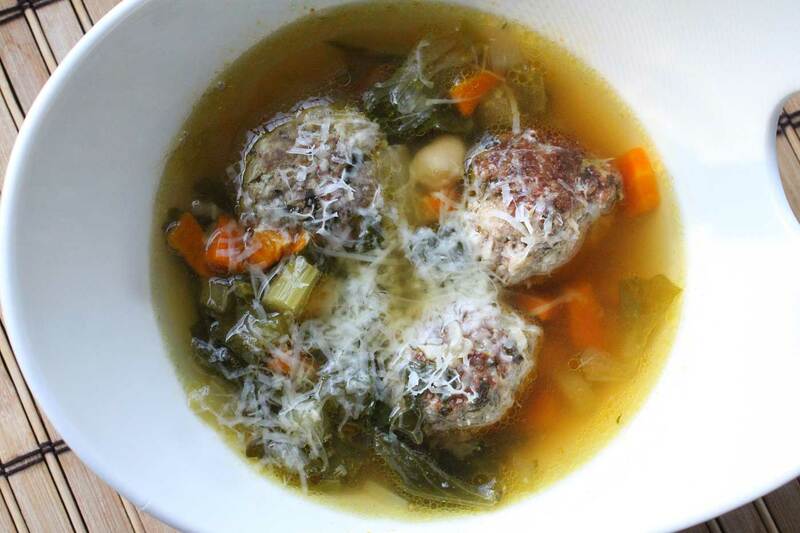 The greens, at least in my opinion, are what shine in this Italian wedding soup. The balance out everything. It’s so savory, garlicky, and just down right comforting. If you are looking for a great soup, give this one a shot, plus it’s a great use of your broccoli and brussel sprout leaves if you are growing them in the garden. Hope you enjoy!